This blog is about magnificent homes, luxury products, precious jewelry, fast cars and some of the most expensive things in the world. Currently, the world’s most expensive electric car is the Rimac Concept One car, priced at a heart-stopping US $1 million. This million dollar car is being produced by Rimac Automobili, an automotive startup based in Croatia. The company envisioned an extraordinary supercar with a new propulsion concept, in an attempt to blend sleek design with amazing horsepower. 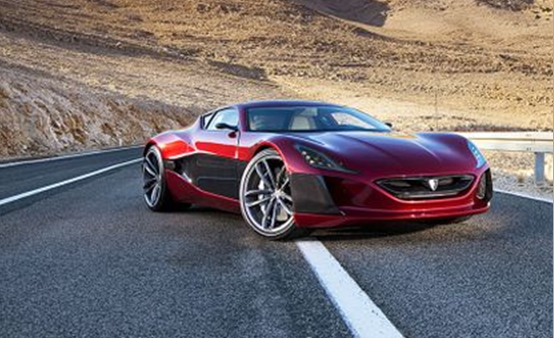 The result was the Rimac Concept One, an awesome supercar, which is sure to turn heads. Rimac Automobili took around two years to produce the Rimac Concept One, which has been dubbed as the first electric hyper car in the world. This electric hypercar has a total of 1,088 horsepower under its hood, and ‘All Wheel Torque Vectoring’. Its low centre of gravity, which offers an amazing driving experience. Its 92 kWh heavy battery pack, which provides a range of 370 miles, if driven at a moderate speed. A top speed of 190 miles per hour. Posh interiors made of leather (designed by a team of former Pininfarina designers led by Mr. Goran Popvic). Rimac Automobili is expected to manufacture only about 88 of these cars in total, with deliveries expected to begin from early 2013. The technology and features of the Rimac Concept One Car has ensured that it enters the exclusive club of supercars, which includes extraordinary machines such as the Bugatti roadster Veyron 16.4 Grand Sport Vitesse. Electric cars are expected to become more popular with multi-millionaires, not because of their low-fuel cost, but because of their environment friendliness – a cause which the affluent simply love talking about. Some celebrities that are big fans of electric cars are Leonardo DiCaprio, Arnold Schwarzenegger, Justin Beiber, Larry Page and Roman Abramovich. Some of the other luxury electric supercars which are expected to be distributed in 2013 are the Tesla Model X created by Silicon Valley based Tesla Motors, the Fisker Karma Hybrid, the Lightening GT developed by the Lightening Car Company, and the Eliica eight wheeled car. A promoted blog post is a great way to gain exposure for your new product or service, and attract the right audience. If you would like to feature your product on this blog, click here. Can't find what you're looking for? Try Google search !